It’s a new routine. 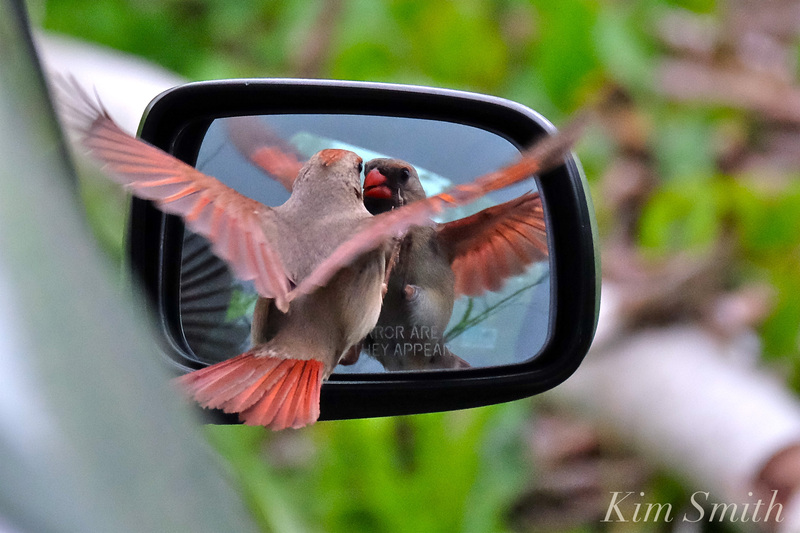 Wherever I park my car on a particular wooded lane, I return to find mama Cardinal attacking the car’s reflective surfaces, both side mirrors and the windshield. She perches in the branches above chortling a medley of warning songs and then swoops in to peck and gnash at herself. I have tried moving my car further down the lane and have covered the mirrors with bags, but still, she perceives my car as “the enemy” and finds a shiny surface at which to strike. 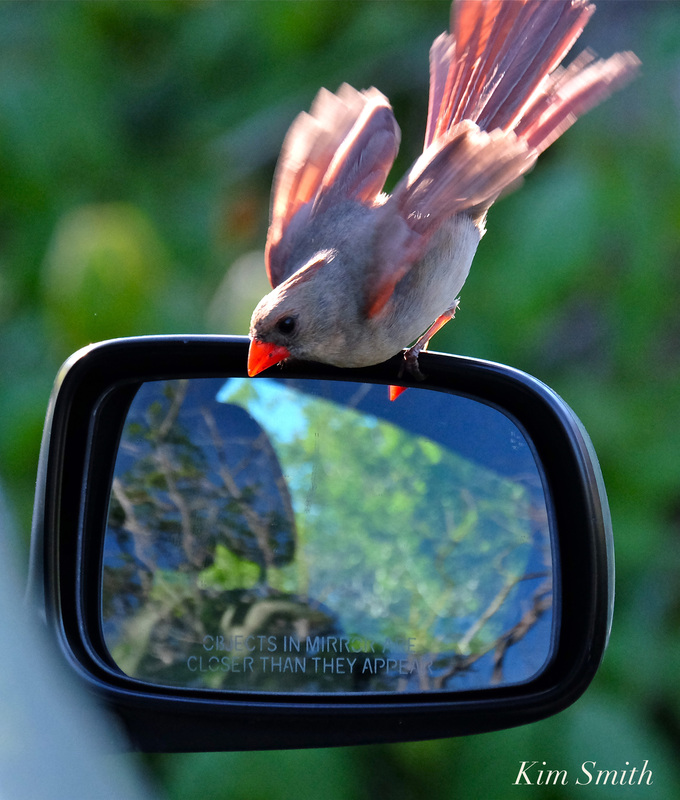 Northern Cardinals, American Robins, and Turkeys are the species we most often hear attack cars and windows. Northern Mockingbirds and American Goldfinches fly at reflective surfaces as well. The behavior is a territorial display; the bird sees in the object its own reflection and imagines the image is competition, or a threat to its nestlings. Some birds, like Mourning Doves, don’t require a large territory whereas I have read that Black-capped Chickadees will chase off interlopers in as much as a 17 acre territory. The mama Cardinal may continue for the entire nesting season, which is of concern as I don’t want her to wear herself out. Next time when at the wooded lane I’ll try parking even further away. 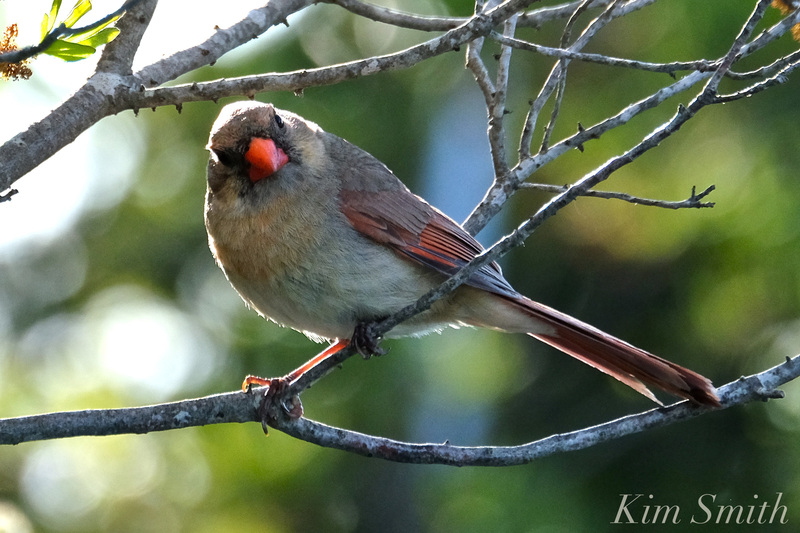 This entry was posted in Birds, Birds of New England and tagged American Goldfinches, American robins, Beautiful Birds of Cape Ann, Black-capped Chickadee, Female, Northern Cardinal, Northern Mockingbirds, WHY BIRDS ATTACK CARS AND WINDOWS, wild turkeys on June 10, 2017 by Kim Smith.